Calan doesn’t think his golf has necessarily improved as a result of his green. Photo: Eddie Jim. The latest home landscaping trend has arrived and it has a decidedly man-child feel to it: introducing backyard putting greens. 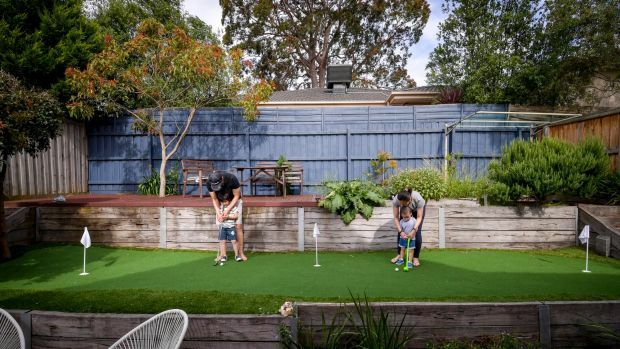 About 500 artificial home putting greens are installed across Victoria each year, according to Matt Curtain, managing director of landscaping company Melbourne Brick. 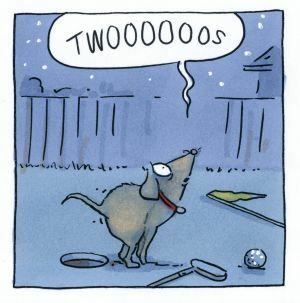 “We install over 200 putting greens every year in Melbourne,” says Curtain. Calan Choke with wife Jan and sons Dylan and Matthew at their backyard putting green. Photo: Eddie Jim. Curtain says typical prices range from $5000 for a 20 metre square side-of-the-house green to $25,000 for a 100 metre square putting and chipping area. 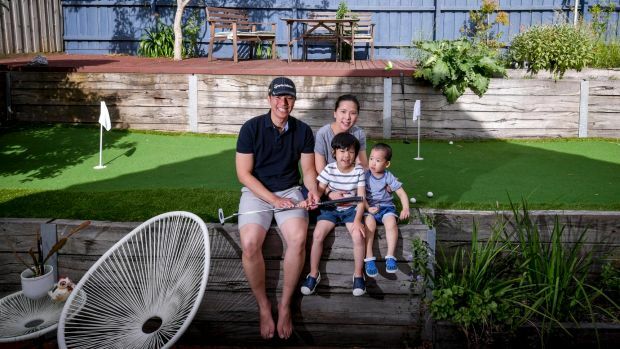 For Burwood resident Calan Choke, 33, the decision to build his own ‘backyard Augusta’ was about cleaning up a patch of unwanted, thorny rose bushes as well as introducing golf to his young family. “I live very close to Wattle Park Golf Course, a nine-hole golf course,” says Choke, who works in banking and first came across the idea in a golfing magazine. “I was trying to pick up the game and I’ve got two young kids, four and two, so I thought it’s a perfect opportunity for them to learn golf [too]. The Chokes are happy to spend time outside. Photo: Eddie Jim. 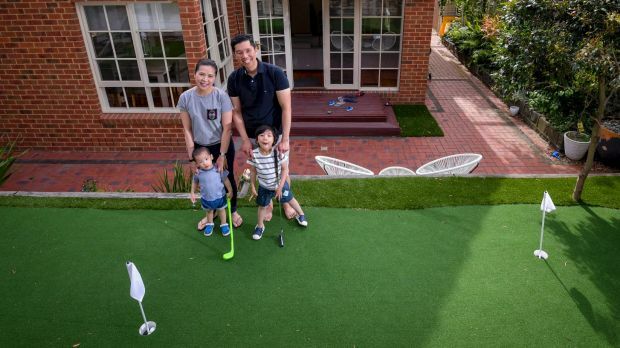 In Cranbourne West, professional golfing couple Steve Kent and Jane Bell had a green installed after living in their new house for six months. “The backyard was a bit ordinary,” says Kent, 44, “and we wondered what to do with it. We thought about putting in some fake grass – [Jane] wasn’t too keen on putting in a putting green but I managed to get my way over that one. The green gives visitors “something to do,” says Calan. Photo: Eddie Jim. The couple, who work as golf professionals at Settlers Run Golf and Country Club and the Commonwealth Golf Club respectively, use their home green to hone technique with chalk line putting drills and straight line stroke movement. Paul Morgante, 52, of Perfect Turf Solutions, reckons he installs a backyard putting green every two months. “For some reason we went through a period where we did three or four in a row for surgeons. I thought, ‘what’s going on here?’… I think it was just a coincidence,” he says, adding that most of his clientele are “your typical mum and dad”. Morgante has been installing greens for the past 10 years and says they are becoming more popular. Back in Burwood, Calan Choke is at home with the low-maintenance aspect of his new backyard. But has his golf actually improved? This story was first published in The Sunday Age on 18 December 2016.